One for the storage hunters out there, unless you really want 256GB of space in your slate you'll probably find a better device elsewhere. The Archos 94 Magnus may look like just another run of the mill Android tablet, but beneath its 9.4-inch display lies a hidden secret. 256GB of internal storage. What's more the 94 Magnus also sports a microSD card slot, allowing you to build on that insane space even more by up to 128GB. If you fancy splashing the cash on the 94 Magnus you'll need to part with £249 (around $380, AU$480), which gets you a 9.4-inch 1280 x 800 display, 1.8GHz quad-core processor, 1.5GB of RAM, 5MP rear camera, 0.3MP front snapper, a 6400mAh battery and Android 4.4 KitKat. The plastic construction does feel a little cheap, and the 94 Magnus is pretty heavy at 570g - you wouldn't want to be holding it with one hand for an extended period of time. It terms of design it doesn't break any new ground, and while it's not the most attractive tablet on the market it is at least functional. The unit I was playing with wasn't final hardware, so some small changes may be made for the final go to market version, and on the rear cover it did say 128GB - which is an obvious mistake. At 10mm thick it's slightly or the porky side, and overall it's a touch bigger than the 9.7-inch iPad Air 2. It's not too overbearing when held with both hands though and the circular power/lock key is easy to find at the top of the right edge. The volume rocker is on the top of the Magnus (when held in landscape) which I found a little tricky to hit, and it's joined by a microSD slot, two USB ports and a microHDMI port. I found the HD display relatively average. Colours are bright and you're able to read everything clearly, but the lack of a full HD resolution is noticeable. Stock Android runs smoothly on the 94 Magnus, and the interface feels slick under finger. 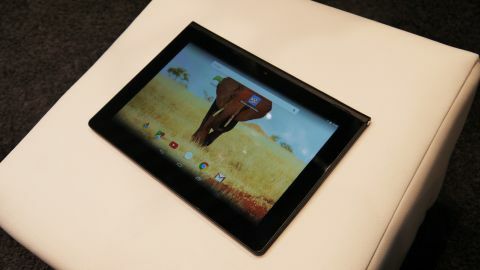 Media fans will love the fact it has front facing speakers, which improves gaming and video playback on the tablet. If internal storage is a big factor when it comes to choosing the tablet you won't find anything bigger than the 94 Magnus, but if you're a light user there are better options available, although you'll probably have to pay more.